Malati [Melanie Nagel] - malati dasi - malati swami secretary and director of ISKCON WV trustee of ISKCON NMV charter member of the "swami mommies" club, columbus safe house for females fearful of NV living conditions, knows of Radhanath's ordering the sulochan whacking, one of the first of Kirtanananda swamis's female sanyassis,"all HIV pos, take sannyas first! ", "katie bar the door!". she opposes "child abuse" and "paying for it", fighting extinction tenaciously. But what Malati fails to mention are her own transcendental qualifications: the fact that she is a lesbian infected with HIV (AIDS) due to excessive intravenous drug use, and the fact that she was previously one of Kirtanananda's female sannyasis, Malati Swami. Such hypocrisy, seeing that they are surrounded by murderers, pedophiles, homosexuals and drug addicts. Why would Malati be intimately involved in canvassing for a murderers release from prison unless she was involved in the conspiracy to murder Sulochan. I have sent this email to you several times, but you still have NOT responded to it. Therefore I am sending it to you AGAIN as well as my sending in a copy to VNN, which at one point you yourself said I should write to them about my experiences with BTS (Bhaktitirtha Swami). Hare Krsna. All Glories to His Divine Grace Srila Prabhupada and to all of our Vaisnava acaryas. Please accept my fallen obeisances. I am submitting the following email which I submitted to Sesa prabhu as the Minister of Justice, his reply to me, and my reply to him to which I got no response after sending the email several times. I have recently left Columbus ISKCON, and ISKCON in general, seeing the existing situation within the movement. I must add myself to the list of devotees who have been forced out of our Father's house. Sadly, many of us have suffered this fate because of our unwillingness to compromise our sense of bonafide Krsna consciousness according to the tenets of Guru, Sadhu and Sastra, and our desire to serve the order of Srila Prabhupada and the bonafide vaisnavas who carry out that order. Today the house that our father set up, is VERY different from that which he intended. I had no realization of what was going on, (the widespread disease throughout the movement), since I was in Africa for so many years without association. It is sad when one is forced to leave one's father's house, especially when that house was built on spiritual truth, but Vidura also had to leave the palace of Duryodhana which originally was his home, but his leaving brought bigger and better things - spiritually of course. Ultimately, Krsna has some grand plan in mind. I am submitting the following only because I feel it is necessary to bring forth these things. Srila Prabhupada purports in BG 10.4, that satyam means truthfulness, that the truth must be spoken for the benefit of others even if unpalatable. If a thief is called a thief, then that is truthful. I was residing in Columbus ISKCON and have since left. While there, I was chastized severely for submitting two articles to VNN in mid April, in which I simply spoke the truth. Malati was also regularly chastizing me for speaking to some devotees about the situation I encountered when I served under Bhaktitirtha Swami for ten years and situation created after he had some difficulty in his sanyas. In Oct 97, Malati approached me saying that she "had heard some 'rumors'" about my situation with BTS, and asked me to tell her what happened. I told her that I did not want to discuss the issue, (as it was obvious to me that she would not be a person who would want to hear about what I had encounterd while serving under BTS). She repeatedly asked me to tell her, so I told her just a little bit, enough to barely touch the tip of the iceberg. In 1990, BTS left me illegally in Nigeria, and I had to bribe my way out of the country to get out safely. 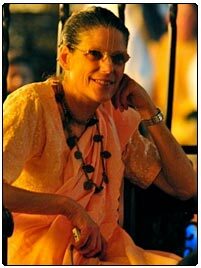 When I returned to the USA, I was forced out of ISKCON due to BTS's dishonesty and lies about me, ALL due to his own unwillingness to face his discrepencies in 1)his sanyas vows, to which I was a witness while I was in Africa, and 2) his own personal dishonest dealings with me with regard to his politics in management, his taking exactly $10,697 from me without my consent. (This is not including the laksmi I willingly put out for the ISKCON Africa mission - ie. my airfares for service to and from Africa as well as airfares for BT Swami and Umapati Swami, and my paying for books for the Africa ISKCON mission). I was also physically crippled due to following some exploitive instructions while in the movement. I served under BTS for ten years and was literally forced out on to the street in USA since I had no ties to anyone, having given up my friends and family to become a devotee. When Malati insisted that I tell her, I spoke a little bit about what happened. Sure enough, (as I thought it would happen), Malati didn't accept anything. She called me a liar, and since that time, has been very inimical towards me, expressing these negative feelings in various ways. The atmosphere was already unbearable, Malati regularly leveling false accusations at me, and getting Yamuna, her second in command, Yamuna to join in. Whenever they would level a false accusation, (So and so said that you said), I would tell them to bring the person - who was in a place where we could all be brought together - in the room and we should see who was really saying what, since I definitely had not said what I was being accused of. WITHOUT FAIL, Malati and Yamuna REFUSED to bring into the room those devotees whose names they quoted as my having "said". I kept asking them why they refused to do so, saying that "He said, she said is simply a waste of time. We can find out who said what much more easily if we are all present." Nonetheless, they ALWAYS refused to do this. I later realized that method was being used to force me to leave because Malati could see that I wasn't her ideal follower and that made her feel most disturbed. I accepted the Bhagavat Purana, the CC and the BG with Srila Prabhupada's purports over the "Malati Purana" where often enough, her (MIS)conceptions and opinions conflicted with that of Srila Prabhupada's purports and the words of Lord Caitanya Mahaprabhu, Krsna das Kaviraj, and those of other great Vaisnavas or incarnations of the Lord, and I would counter her arguments with the scripture. As Padma Purana says, sruti smrti puranadi pancaratna vidhim vina... If devotional service does not follow the criteria given in the bonafide scriptures, then it is sentimental or fanatical and causes nothing but disturbance in society. I could not falsely accept the concoctions that I was being told I should accept, especially if it meant rejecting Srila Prabhupada's standard and that of the bonafide scriptures. The final "blows", (or should I say, strokes of mercy), came when Jahnava, (previously Jotisthoma) - who took reinitiation from Srila Narayan Maharaj, and who lives in Columbus from Spring to Fall - told Malati and Yamuna, that I DARED to go outside of ISKCON and went to see Srila Narayan Maharaj. (I had already told Malati that I planned to go see Srila Narayan Maharaj and make my own judgements since I was so sick of hearing their non-ending blasphemy of him. (Funny, it was this blasphemy that finally got me to decide to go to see who this - according to them, "terrible", but I found - WONDERFUL Vaisnava was. I have to thank Yamuna and Malati; if it wasn't for their blasphemy of Srila Narayan Maharaj, I would never have gone to see this "nefarious personality" who I then found out was very wonderful indeed. THANK YOU YAMUNA AND MALATI. These two were so incensed that dared to go to see His Holiness Srila Narayan Maharaj, that they did anything and everything to hasten my leaving Columbus, including their STEALING of my Govardhana Silas from the alter. YES, THEY STOLE - THAT'S RIGHT, STOLE - my Govardhana Silas; Giriraj and Sri Sri Radha-Raman, (also called Damodar). I had already planned to leave, being sick of being so stifled and so much subjected to Malati's abuses, both verbal, and otherwise. I had even written Malati a letter in early April in which I told her that I would be leaving the latest by the end of May. (My rent was paid up until May.) Nonetheless, Malati in her anger that I, "AN ISKCON DEVOTEE" should DARE to go to hear from an "outside" Vaisnava, especially one such as srila Narayan Maharaj, THAT was TOO MUCH. Thus I submit the following to the assembled Vaisnavas. I would have submitted this earlier, but I did not have access to a computer. I will submit my original handwritten letter to Malati at a later time, (where I asked her to reply, and which she did not), as well as Malati's final letter submitted to me in which she makes many false statements. I am hoping that if it goes on VNN, (when I can get it typed out), that Her Grace Malati will be so kind as to reply to me, since she would not when I gave it to her personally. Prabhu, you said that you would email me back but I have not heard anything from you. I will be leaving Columbus when I can arrange a truck, a driver and a place to live. Malati insists that I am lying with relation to that meeting, although when she asked me to move here - she was hoping that I would preach and make devotees for her temple - she said that she would see to it that BTS would reimburse me for the expenses I incurred in going up to buffalo to find a place to live, (before she talked me into moving here instead). She also at that time agreed that my moving to Colubus being "a temporary stopover", BTS should and would - she said that she would see to At any rate, you said you would email me as to the results of your contacting BTS after hearing from Lila Suka and Radha Dasi, substantiating that what I was telling you with regard to the meeting and the decision rendered was true. As for my future, I am leaving ISKCON, and I hope to Krsna that I NEVER EVER see another ITS GON devotee again. Of course if someone comes to my place of residence, I will welcome them, even the liars and cheaters, because even an enemy is to be welcomed and treated with all love and respect when s/he comes to ones residence, but as far as my setting foot into an ITS GON temple, forget it. These are NOT my Guru Maharaja's temples anymore. I honestly do NOT feel that Srila Prabhupada would be pleased. Original message from: "COM: Sesa (das) ACBSP (GBC)"
My dear Godsister: Please accept my humble obeisances. All glories to Srila Prabhupada. If ITS GON, so am I. Tell me why I should take my time away from serving Srila Prabhupada's mission to repeatedly bang my head against the wall trying to help someone who makes such childish statements about ISKCON. If YOU"RE GON then I will not interact with you in my ISKCON capacity. Rather I shall refer you to Srimad Bhagavatam 1.17.17-22 which describes how one should preceive injustices one suffers in this world. As you are out of ISKCON, this is the only advice I can offer. Hare Krsna. AGTSP PAMFO I hope you are well. I do appreciate your address, "My dear Godsister". To be honest, I always did appreciate what I perceived in you in the 70s. (I thought I saw in you humility and honesty, even though I never did really meet you. I just thought I was seeing these things in you back then. Sorry you had to "repeatedly 'bang your head against the wall'" for me. I didn't realize you were that involved in this issue, other than your sending out the draft concerning how the meeting was to be conducted, and your later emailing BT Swami asking him to answer my statement that he had not reimbursed me for the laksmi I had to put out for moving, when I explained that that was what was decided at the meeting, and he denied it. I know when I met you the two or three separate times at the Rathayatra festival in Toronto, the only thing you told me was that you talked to BTS and that it was not possible to arrange any meeting. Malati said that she had taken it upon herself to handle the issue and said she went to BT Swami and asked him to meet and that he agreed to it. She said that she had initiated it herself, that it had nothing to do with you other than your approving it; thus I credited her with having arranged the meeting in which she made it VERY obvious that she was completely innimical and did not really want to see things discussed, but was doing it only so that she could say that it got done. She had already condemned me in her mind, since 10/97, many months before the meeting of 7/10/98, repeatedly calling me "a liar", and "offensive" in that I would DARE to try to say that an ISKCON leader had done such things to me. (She always insisted that I was lying about what I explained I had encountered while serving under BTS. Funny thing is that I would never have told Malati anything, knowing her mood - she even condemns the Gurukulis who were molested for speaking up about what happened to them. As Malati has repeatedly, (and I think, hard-heartedly said), "It was their 'karma'; they 'DESERVED' it. They are 'WORSE than their purportrators'. If they were proper devotees, they wouldn't say anthing about it, knowing it was their karma." And she will go on and on about how the victims of these situations are "WORSE THAN THEIR PURPORTRATORS" because they have spoken up about what happened. Malati was the one, who after my several times explaining why I did not want to tell her what had happened - that I thought she would not want to hear the issue; that she wouldn't believe anything that I told her, and so on - INSISTED that I tell her, since she had "heard some rumors concerning Bhaktitirtha Swami and you", (the "you", meaning me). If you also helped to arrange the meeting, then I give you that credit. Malati claimed full responsibility for having made the arrangement. I just believed what she told me, (that she arranged it and that you had nothing to do with it other than giving your approval) - After all, I was only asking you, for a few years, as the Minister of Justice, to make some arrangement that the situation should be addressed, "In the presence of ANY Deity Bhaktitirtha Swami chose" - that I would go anywhere he wanted to go before the Deity - and "that it be conducted in the presence of one or more senior 'non-partial' Vaisnavas", and you never arranged anything in all of those years. Thus, when Malati told me that she was fully responsible for arranging the meeting, I gave her full credit. The meeting Malati arranged was conducted by her with Radha Dasi, (a junior devotee), Jai Sri, TP of New Vrndavan, (who takes siksa from Bhaktitirtha Swami), and Lila Suka there. I am just a person who can't stand lying, duplicity, dishonesty and the like; it just causes confusion. I forgave BT Swami for all of his atrocities committed over the ten years I served under him, (and the repercussions he later caused to me with his lies and assasination of my character), but when he went ahead to steal my Deities laksmi, (for the second time), and then left me in Nigeria illegally, hoping that I would get taken to jail and killed, simply because of his concern that I knew about the difficulty he experienced in his sanyas, and I ended up having to figure out how to get out of Nigeria safely, and landed up out on the street for a while in USA before I could find a place to stay, that was a bit heavy. I just couldn't relate to it. (See the statement about the master dragging his servant back by the hair in CC antya lila 4.46,47 that I mentioned in the copy of the report I sent to you. What to speak about a servant who has served his master faithfully for years, and the master kicks him out, (taking the servant's laksmi), because the master is afraid the servant may tell someone of his master's deviations. I NEVER left; rather, the master under who I served faithfully for ten years, KICKED me out because of HIS OWN FEAR of what he FELT he "had to hide". If only we could all just be a little bit more honest and STOP PRETENDING that we are on a higher platform than we are REALLY on. Malati was at the meeting. She KNOWS what was said. I don't even care about the laksmi, but I do care about the integrity of the matter. I do care that Malati got me to come here and in the beginning told me that SHE would see to it that BTS should reimburse me for all of my moving expenses, the move out of NV, (with my intent to move back to Buffalo and the expenses I put out for that endeavor, going to Buffalo by Greyhound bus and putting down a deposit on a place to live.) Malati asked me to give up that plan, (of relocating to Buffalo) and instead come here for at least a year, and I agreed to it). Malati, when I asked her, told me that she would write to BTS, and tell him of my expenses put out, that she had asked me to come here instead, and that BTS should, pay these present expenses, and those of the future if I should choose to relocate out of Columbus. As she herself said, she would inform BTS that this was HER request that I come here for some time as a "temporary stopover" if in the future I should decide to go. Malati had me give her the original receipts which she apparently destroyed. She later LIED, and said 1) that "There was never any such decision made at the meeting", and 2) that she "had paid my expenses 'as a courtesy to the Vaishnavas, BTS and MVV'" That was not true. She did NOT pay any of the laksmi that I put out towards my original intended move to Buffalo. After a while, (especially since I had to suffer for so long with BTS's lies, where after 10 years of service to him, the risks taken in that service, (including my being physically attacked on numerous occasions), and then literally ending up on the street in USA as a cripple, with quite a number of my very good devotee friends rejecting me because they, being convinced by BTS's charisma and position, preferred to believe his lies over my truth. I do understand the philosophy, but at the same time I also have feelings. Even our own Father, (Srila Prabhupada), after so many years felt some pain over what happened to his Guru Maharaja's mission. (Proof of that is that Srila Prabhupada wrote things in his CC purports concerning the issue, so many years later.) Don't you think that maybe all of this might have some negative effect on me, the fact that I am telling the truth, and am being disbelieved ONLY because my Godbrother has a position and people fall for charisma and position. Don't you think it bothers me the fact that I see that enough of our ISKCON leaders, including the ones I have tried to responsibly address my issue to, are not being honest? It DOES bother me. It bothered Srila Prabhupada when the devotees he placed into managerial positions, due to their own material desires, were not acting like proper Vaishnavas, and instead had their own agendas, thus causing pain to the "common" sincere devotees, with their duplicitious activities, and out and out lies. (Maybe our leaders should take a couple of psychology courses to understand how and why it is that people become affected by emotional pain. Maybe afterwards they will be able to understand why it is that we haven't jumped to that platform of not being able to be affected. You told me to look at SB 1.17.17-22. Sadly, (as I think I told you at one point), when I sustained one very severe attack in Africa, I lost some of my processing faculties, including my ability to comprehend written material. (BTS could see that I wasn't even able to speak properly, and despite my already having contributed thousands of dollars to the Africa mission, BTS never even sent me to a doctor. (I guess he did not want to waste the laksmi. I couldn't go myself because BTS had taken ALL of my laksmi while in Zambia, (saying that he "would keep it safely for me" I think he meant, "keep it safely for him" as he refused to return it to me when I asked him for my laksmi). How can I possibly call the present day "ISKCON" by that name when our leaders get rid of - either by lies, threats, character assassination, other pressure tactics or even by murder - devotees who are sincere in their practices of Krsna consciousness. This is not what Srila Prabhupada taught. Why are my GBC and/or guru Godbrothers kicking out their sincere Godsiblings from our Father's temples? Do you have a good answer? Srila Prabhupada set these temples up specifically for those devotees who wholeheartedly wanted to dedicate their lives to the practice and preaching of Krsna consciousness. Now we are being forced out ONLY because we are HONEST disciples of Srila Prabhupada, and our Godbrothers and and even Godsisters in leadership positions are kicking us out, threatening us with violence, (and even using violence), ONLY because we ARE honest and properly practicing disciples of His Divine Grace AC. Bhaktivedanta Swami Srila Prabhupada. Sesa prabhu, you are the "Minister of Justice." Doesn't this bother you? I'm sure you know what is going on; it is all SO BLATENT!!! I showed Malati the scriptures: Srila Prabhupada's own words, Lord Caitanya's own words, (quoted by Srila Krsna das Kaviraj Goswami), and quotes from the SB. Malati REFUSED to accept the scriptures right there in black and white; instead she shouted them down. When we reject or refuse to hear and/or accept our three way balance system, BONAFIDE guru, sadhu and sastra, and instead accept a personality because of his position and/or charisma, then we have a cult. Srila Prabhupada did NOT create a cult - even though he himself refers to the "cult of Krsna consciousness", but we all know what Srila Prabhupada means, and he did not mean cult in the commonly understood form of the word. It is obvious that Malati has all along not been dealing honestly with me with regard to the meeting, and is simply not interested in dealing truthfully with regard to another leader's dishonesty. In her dealings with me, she has made it VERY obvious that this is due to her own dishonesty. I tried all along to make myself believe that she was innocent. I tried to convince myself that due to the effect the drugs and aids had on her brain, she could not understand certain things or had simply just forgotten, but it is obvious that that is NOT the case. By dint of everything that has gone on, including her stealing of my small Govardhana Silas, her false accusations of me where she just points her fingers in my face and refuses to let me speak, and so much else - including her getting rid of the receipts she had me give to her, and her lying to you, saying that she paid my expenses, that there was no agreement in that meeting, etc., she has proved herself to be very dishonest, duplicitious and an out an out liar. Sadly, she has implicated herself by dint of her dishonesty. When I get settled, if you wish, I can send a copy of her letter to me. (I will add my comments to poing out where what she is saying is not true. When I saw that letter, I was quite amazed with the false statements she put into the letter, but then again, on the other hand, I wasn't amazed since she has been showing her colors all along, and it has been for at least the past two months, I realized the position that Malati was taking was not due to innocence and a defective memory - although she does also have a problem with memory. She has made it VERY obvious that what she has been doing is VERY purposeful, and it is sheer DISHONESTY. (The agreements made in the meeting and her lying to you about them as well as so many other things.) I just didn't want to believe that Malati's subsequent verbalizations and actions were made out of dishonest motive, but sadly, she has PROVED me wrong in trying to see her in this light. It is obvious that she was being dishonest all along in her dealings with me. Sadly, she is following in the footsteps of the current vaisnava "acaryas" of our present day ISKCON. April 6, 2009 - Trivikrama Swami wrote: Dear Radha-Govinda dd. Why not approach Mother Malati now, she has a zone and could probably give you facility somewhere. She is also in a better position then me to influence the current GBC. Hare Krsna Trivikram Maharaj, All glories to Srila Prabhupada. PAMFO I hope all is well. The Pandavas in the forest, Duryodhan in the palace; the prostitute praying to Krsna for forgiveness, the brahman counting her abberations. From the few private exchanges we've had, it's obvious you don't want to address the things I brought up regarding present-day ISKCON/the GBC. (I was pretty sure that would be the result; thus, my originally putting my questions to you "publically" on that list of devotees since it would have been been a forum in which you would have been more likely to have given answers to these questions. Anyway, ultimately we know that Srila Prabhupada's ISKCON has become deviated (at least presently) due to the materialistic desires of certain people who have placed their own material objectives before that of Srila Prabhupada, and are using Srila Prabhupada's ISKCON institution to fulfill such desires. At one point, because I had created the program through which Malati ended coming back to ISKCON, and her remembering our association through that time, before my going back to my service in Africa, Malati liked me VERY MUCH! but!, later on, Malati ended up HATING me DIRECTLY BECAUSE of the BT "thing" (especially since it was BT and Radhanath who put Malati into her GBC position). But I do appreciate the time you took to write, even if you avoided dealing the specific questions I was writing to you regarding GBC and ISKCON guru deviations. May Srila Prabhupada give us His mercy and shelter. Why would the chief prosecutor from the District Attorney's office be randomly calling up devotees to speak about Tirtha Das and his possibility of getting a pardon? I wonder why other devotees haven't received similar random phone calls from Mr. Michael Smith. I wonder how Mr. Michael Smith managed to get a hold of Malati's phone number, so that he could proceed with his random call to her and randomly speak to her about Tirtha's possibility to be pardoned? It is obvious the only way that the District Attorney's office would be calling Malati to speak about Tirtha Das' possibility of being pardoned is if Malati herself initiated the request for Tirtha's pardon. Malati is the one who has been contacting Mr. Michael Smith, canvassing for Tirtha to be released from prison on the grounds that he is a "changed man". There is no other way that the district attorney's office would, on its own accord, look up Malati's phone number, call her and suggest to her that murderer Tirtha Das should be pardoned. It is an absurd scenario. The fact that Mr. Michael Smith refers to Tirtha by his initiated name is proof that this canvassing and these secret "pardon request" conversations have been going on over a long period of time, to the point that he now is comfortable with calling Thomas Drescher by his devotee name, Tirtha Das. Further, consider this point: A prosecutor does not maintain contact with the people he has prosecuted after they are sentenced. The only way that the chief prosecutor would again be involved with this person, 20 years after prosecuting him, is if he had been contacted by that person's lawyers or supporters (Malati), with the intent of getting a recommendation for a pardon. The pardon would likely have to come from the State Governor, so Malati and Tirtha would need to gather as many recommendations from respectable people as possible to try to sway the opinion of the State Governor. Tirtha Das had been sentenced to life with no possibility of parole. His only chance for being released is if Malati can convince the State Governor to pardon him, and that is what she has been working on for many years. But let us ask ourselves the real relevant question: Why would Malati be intimately involved in canvassing for a murderers release from prison unless she was involved in the conspiracy to murder Sulochan. all of the leaders of New Vrindavan likely were involved in the murder plot and approved of it. Radhanatha Swami may have been the leader in the conspiracy, but he would have taken advice and guidance from the other leaders in the New Vrindavan community before making such an important decision: people such as Malati, Devamrita Swami, Candramauli Swami, Umapati Swami, Bhakti Tirtha Swami, Kuladri and others. Because of their involvement in the murder conspiracy, all of these leaders have been providing all varieties of peculiar favors to murderer Tirtha Das while he has been residing in prison. These have been more thoroughly detailed in my previous article. Now it is clear that Malati has been working towards the biggest favor for Tirtha Das, getting him a complete pardon for the murders so that he can be released from prison. I'm sure if one were to check the government records there would be a trail of all sorts of connections between Tirtha Das and the New Vrindavan leaders going back 20 years: prison visits, applications on his behalf, lawyer fees paid for, court cases filed on his behalf. If the GBC really wanted to connect the dots, everything can be found, but they are not interested in digging up past dirt that will make them look bad. Several of their ISKCON rubber-stamped gurus are involved in a murder conspiracy: Radhanatha Swami, Candramauli Swami, Bhakti Tirtha Swami, Umapati Swami. The latest confessions by Maha Mantra Das further confirms Janmashtami Das' statements and helps in tying up a lot of loose ends. He states that he was shown a letter written by Sulochan that called for the murder of all ISKCON gurus. If we read the book Sulochan was writing at the time of his death, "The Guru Business", we don't find any suggestion to murder all ISKCON gurus. For example, he includes an interview about Hridayananda Das Goswami, where he concludes that HDG was at least externally following all of his sannyasa vows (though he was still deviating from Srila Prabhupada philosophically). It does not sound at all like he would have been advocating for HDG to be murdered. Thus we have to wonder whether this purported letter from Sulochan was really written by him, or whether it was a gimmick to fool people into killing him. Could Rameswara or Kirtanananda have made a fake letter to get their disciples to carry out the murder "for the guru's protection"? Perhaps if some devotee can recall receiving this letter directly from the hands of Sulochan it can be accepted as authentic. Otherwise we have to doubt anything connected with these criminal leaders. In New Vrindavan the murder was justified by claiming that Triyogi (the devotee who attacked Kirtanananda with an iron pipe) had been sent by Sulochan. If they didn't kill Sulochan, it was only a matter of time before he sent someone else to murder their pure devotee guru Bhaktipada. For the innocent it became a matter of defending their spiritual master from physical harm, and this justified their actions in their minds. But for the higher-ups who were aware of Kirtanananda's child molestations and homosexuality, this obviously wasn't an influence. They were fully aware of his low character, so they were acting on a completely different level of motive. And for Tirtha, as well, the motive was something else, for he had been offered a large cash payment for completing the crime - just before being ratted out and locked away for life. Whether Tirtha had been ratted out by Rameswara's side (to hurt Kirtanananda), or whether Kirtananda himself ratted him out to avoid payment and to find a fall man is not clear. So they made Tirtha a hero, presented him as the greatest devotee, gave him sannyasa, authorized him to initiate his own disciples in prison, paid special visits to him every week, provided him with spending money - all to fool him, so he could not figure out that they themselves had ratted him out. Tirtha, how did they catch you the day you were supposed to flee the country, waiting at the bank to change the cash into traveler's checks? How did they know the exact location you would be in, and the exact time you would be there? Why was Tapahpunja Swami (a co-conspirator in the murder) arrested along with you at the bank, but released just three days later. Could it be that he was there on the order of the FBI to bring you to the right spot for the arrest? In the end he got off pretty light, while you got life without parole. Is there any connection between his actions on that day and his light prison sentence? Think about these things and understand that these people are not worth protecting. They are only externally your friends because you could put them away in prison for years. What about the early murder attempts on you in prison. Who do you think was responsible for those? On one side they were patting you on the back, and on the other side they were trying to have you killed. Do what would please Srila Prabhupada and put this entire mistake behind you by telling the truth about the past involvement of these corrupt leaders.